The time has come for another “One Room Challenge”! Seeing how much work my last ORC was (see that here) I’m a little nervous to complete my space. In theory, I don’t have much to do, but I know that won’t be the case. For this Spring 2017 challenge I’ll be tackling my kitchen! I’ll be keeping with my Modern Rustic style, where I incorporate modern finishes with a little rustic coastal meets farmhouse charm. My kitchen has already received some updates since we bought our home. 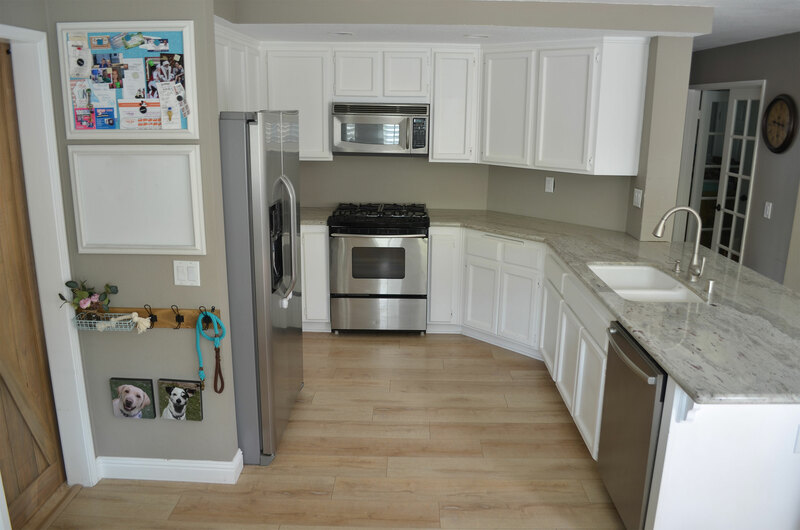 For starters we installed new wood laminate flooring, new River White granite, a new sink & faucet, and gave the cabinets a white coat of paint. The big problem is that the paint I used has not held up on the cabinets, so I’ll be repainting them with the correct paint. Here’s a before and after. The before is when we purchased our home almost 4 years ago, and after is the current state. My kitchen is normally not this clean and empty! I removed all the clutter to help get things started. Makeover Table, I’m really excited for this one! I would also LOVE to get new appliances, but that’s a big MAYBE! The refrigerator is about 6 years old and works great, but the stove, microwave, and dishwasher are all over 15 years old and ready for a update. The only thing they have going for them is that they’re all stainless steel. Well as I mentioned earlier it will be a Modern Rustic style. You’ll have to stay tuned next week to see my inspiration, but here’s a little sneak peek! Thanks again to my amazing sponsors that are helping me get this room done. 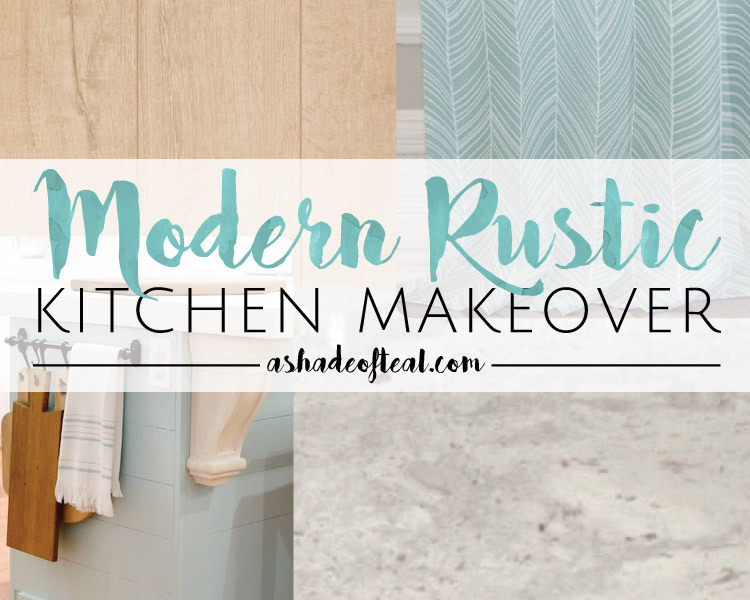 I hope you’ll join me every Wednesday and see the progress of my Kitchen makeover, and thanks so much for stopping by! What a freaking bummer you have to repaint the kitchen cabinets. What did you use before?! We are doing a kitchen makeover too! Bummer on the cabinets, but will feel good to get it done right. Good luck! We will definitely be following along! Yeah, another kitchen! I’ll definitely be following along to yours as well. Good luck! It’s fun yet crazy, but I always love the push to complete a project/room. It’s feels amazing to see the results once it’s over though. Good for you for taking on your kitchen! I’m so sorry you need to repaint your cabinets – I know how time consuming that is! I can’t wait to follow along! Thanks Jenny! I’m hoping it won’t be as bad as I think! Can’t wait to see your kitchen all done! 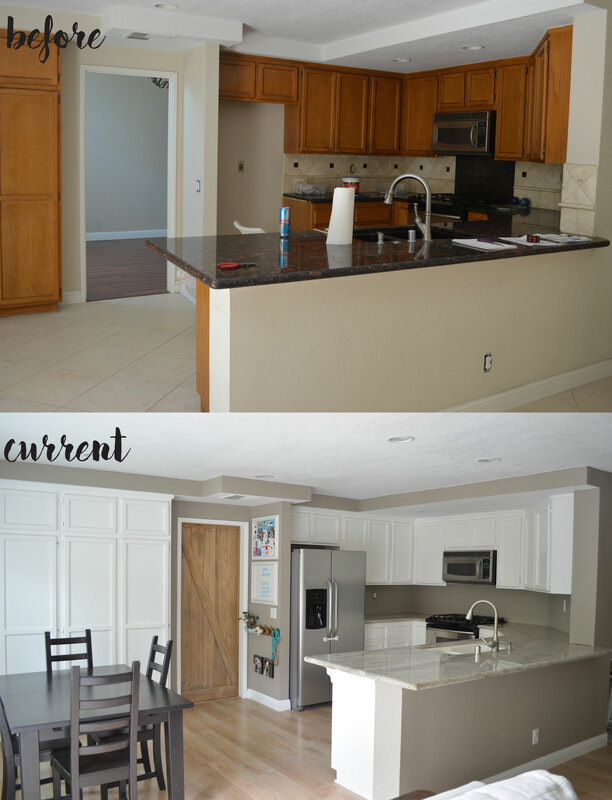 Painting cabinets is a lot of work – we did that in our first home. Sorry you’re having to do it over, but it’ll be so worth it once they’re all done! That’s what I’m thinking. Last time was just a quick job, this time will be more thought out including prep work. Its going to look wonderful. Love your plans and you can absolutely do it! We’re tackling our bathroom at the cottage. Also kind of rustic coastal! I love rustic coastal! I’ll make sure to follow along. 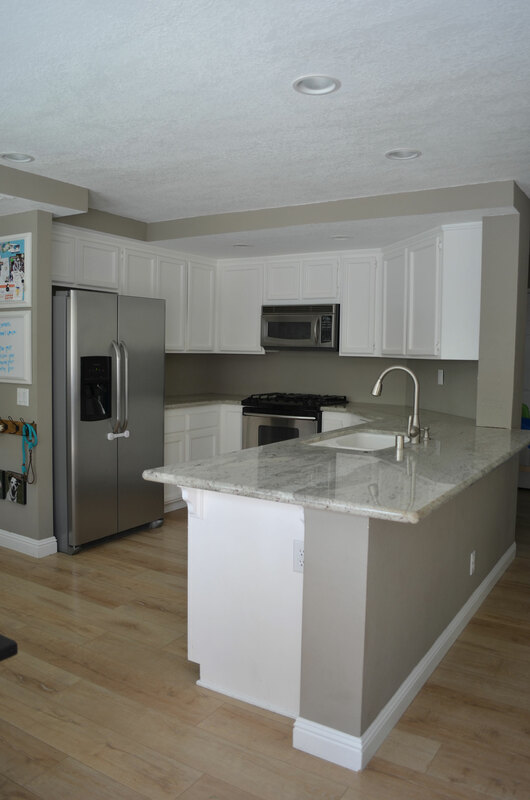 Oh wow – this is going to be great – I love kitchen makeovers!! It’s definitely too bad about having to re-paint your cabinets, have you picked your new paint yet? I used Benjamin Moore Advance paint on ours two years ago and it’s held up really well if that helps at all 🙂 Can’t wait to follow along on your projects! Thanks Casey, I’m actually going with Dunn-Edwards, but I’ve heard great things about that paint too. I love that blue-gray-green(?) paint on the peninsula base in your inspiration photo! That’s going to look great with your gorgeous countertop. I’m doing a much smaller kitchen project – (very much needed!) organizing. Our appliances were about 18 years old when we moved into our house in 2009 so we’ve replaced them all (except the refrigerator) because they broke. I was really glad when the dishwasher broke! Maybe your dishwasher and stove won’t last too much longer and you can replace them! I’m looking forward to seeing your finished ORC. I love kitchen makeovers. I know, I’m always wishing they would break! Good luck on your kitchen! You’ve got a great space to work with. Big bummer that you have to repaint the cabinets. What a pain! The new plan looks very pretty! Your kitchen has such good bones, it is bound to turn out amazing. The natural wood door that you installed already brings in a modern country flair, so I can no wait to see what other design ideas you have planned!